This adapter is the same as the most basic of lens adapters (which can be found on eBay for as little as £20) in that it simply allows the use of a different brand of lens on a camera, and does not feature any electronic contacts, an aperture ring or an AF motor. 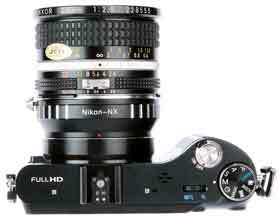 As with all adapters, this Nikon F to NX model adds the precise extra physical space needed to create the correct flange depth (the distance between the imaging sensor and the rear of the lens mount) for the mounted lens. This is because the Samsung NX flange depth is much shallower than that of the Nikon F, and it is necessary to provide accurate focus. I used the adapter with several lenses, both old and new. There are, however, some key handling issues to consider. First, a lens with an aperture ring is necessary for any control over aperture. Modern lenses without aperture rings can still be used with the adapter, but the lens will be fixed to its smallest aperture, which is no good for low-light or shallow depth of field work. Furthermore, on any lens the smallest aperture is typically the worst optically – with loss of critical sharpness – so it’s a setting best avoided in virtually all scenarios. Second, with no electronic contacts, exposure information is only relayed to the camera by TTL metering. This means that aperture priority works once the aperture is manually set on the lens, but for control over shutter speed it is best to set the camera to manual exposure mode. The adapter also does not feature an AF motor. So once again manual control is necessary, this time for focusing. Like most CSCs, the Samsung NX200 offers focus magnification with its own NX lenses. This is a very handy tool for accurate manual focusing, activated when the lens focus ring is altered. However, with no electronic contacts on the adapter, one needs to press the OK button instead to get a magnified view. Given that the camera does not have a built-in viewfinder, a magnified view is essential to achieve accurate manual focusing pre-capture. As they lack an aperture ring, Nikon G lenses like the 50mm f/1.4G are for the best part unusable. The 20mm f/2.8 manual lens, however, does offer aperture control and is an excellent optic. Mounted on the Samsung NX200, the 1.5x crop factor gives the lens an effective focal length of 30mm, which is ideal for street and landscape photography. As the Samsung NX system is still relatively new, the choice of lenses is not as great as with other systems, so an adapter therefore opens up a whole new world of glass, provided that the lack of autofocus is acceptable. Many excellent manual Nikon F lenses, and AF-D optics that feature an aperture ring, can be bought for a good price, and it is possible to get some great results with this set-up, especially considering the NX200’s whopping 20-million-pixel resolution.